Hi, Monday. I vote that we all go back to bed and declare today a wash. No? I don’t have the power to make those kinds of decisions? OK, then let’s at least have pizza for dinner. Traditionally, Friday night is pizza night, but I’m sick of letting Fridays have all the fun. 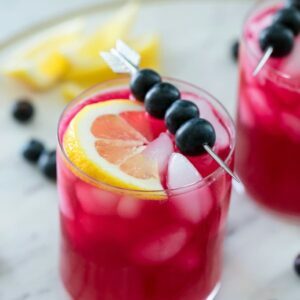 They have cocktails, Dateline, and everyone in a good mood. Mondays get “a case of the Mondays,” meetings, and that constant feeling that you didn’t use your weekend as wisely as you should have. Well, and The Bachelor. Thank goodness because I’m not sure I could do them if I didn’t at least have that small concession. But yes, I know that for most of you, that is not a Monday perk at all and is maybe even another strike against Mondays. In that case, you probably aren’t interested in hearing all about the Bachelor podcast I discovered yesterday (because I totally need to spend another hour of my week on all things bachelor-related). I won’t bore you with my thoughts and opinions on this season (ugh, I have SO many). Anyway, I consider Caesar salad my old standby food. I’m pretty much always in the mood for it, sometimes I seriously crave it, and it never lets me down. I sometimes feel bad about ordering it out probably because it makes me feel like a kid. It was pretty much all I ate at restaurants (that and french onion soup!) for a good few years when I was in middle school. But I never feel bad about making it at home, sometimes as a meal and sometimes as a side. 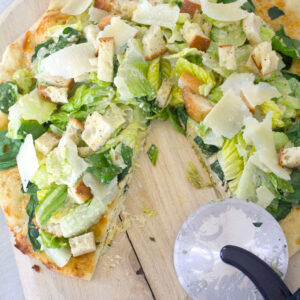 Caesar salad goes especially well with pizza… And now I know that it also goes well ON pizza. Now, instead of just craving Caesar salad, I’ve been thinking about this Caesar Salad Pizza nonstop. I made my own crust (with parmesan dough! ), but you could also feel free to use store-bought dough instead. While I felt that this Caesar salad must be made with romaine lettuce, I wanted to add a little bit of nutrition, so I layered on some baby spinach leaves, too. And obviously plenty of dressing, parmesan and mozzarella cheese, and croutons. All on top of a super crispy thin crust, which is my favorite kind of crust in the world. Legit I could eat this entire pizza on my own. In fact, this would probably land on my list of top 10 foods I could never get sick of. Somehow, I practiced self control and ended up having some leftovers to bring to work the next day. Which also made for the best Tuesday ever. Obviously this would be just lovely on a Friday. But I feel like I’d appreciate it more after a long hard Monday when I just want to sit and watch The Bachelor and have a little downtime before the rest of the workweek. I’m already happy enough on Fridays and have enough joyful activities to keep me occupied. I wouldn’t even be able to give this Caesar Salad Pizza the attention it deserves. Also, the dough and Caesar dressing will stay good in your fridge for a couple days, so you can make them on the weekend and then just assemble everything when you’re done with work on Monday. See? I’m trying to make your Monday as easy for you as I possibly can! And when you know this Caesar Salad Pizza is waiting for you at the end of a long Monday, getting through the day will be a breeze. You can just repeat to yourself over and over “pizza, pizza, pizza…” (but not in that Little Caesar’s Pizza voice, please). I’ll probably throw in a few “Bachelor, Bachelor Bachelors,” too, but you don’t have to. So, there you have it. Monday night is now pizza night and I just made it so much easier for you to get through your day. I vote we all start with this Caesar Salad Pizza and that we cuddle up for the night and put something good on TV while we eat. And when I say “good,” I obviously mean “really trashy and ridiculous and played out.” But if you’d prefer to watch some actual quality television, all the more power to you. What’s your Monday night television show of choice? 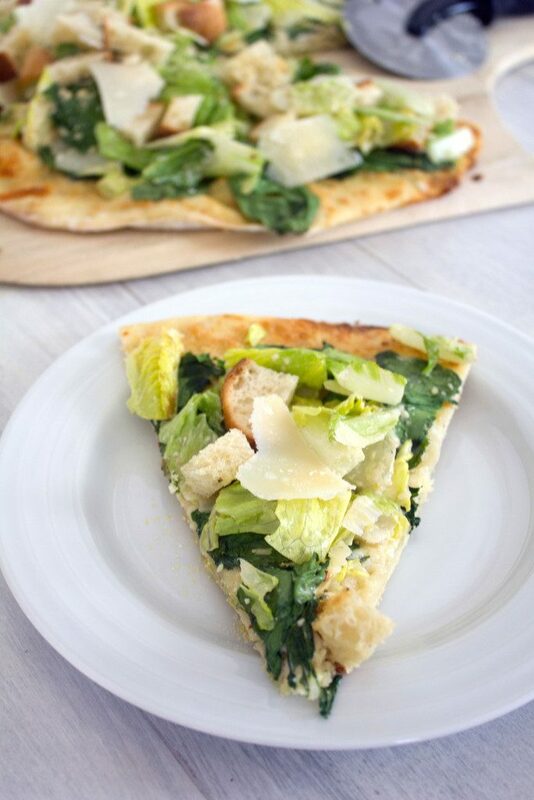 Have your pizza and salad together with this delicious recipe for Caesar Salad Pizza. It involves thin crust parmesan dough, lots of cheese, spinach, and a creamy dressing. Pre-heat oven to 450 degrees. 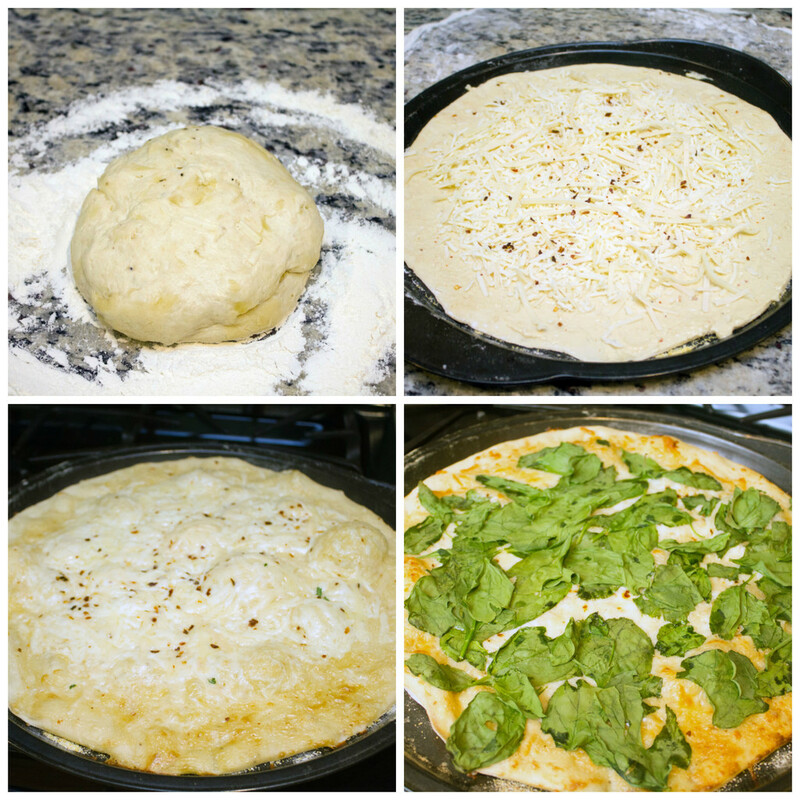 Place pizza stone or foil-covered pan in oven while it's heating. On a floured surface, separate dough in half and roll half of it out into a large round (wrap the other half in plastic and keep in the fridge for another pizza). Sprinkle mozzarella cheese, parmesan cheese, and red pepper flakes over pizza dough. Bake pizza at 450 degrees for 5 minutes. Remove from oven, place spinach on pizza, and bake for another 6 minutes. 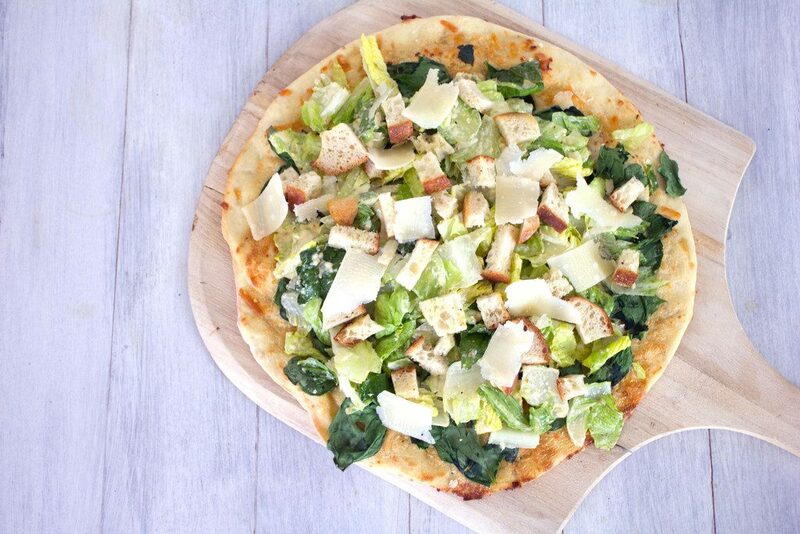 Top pizza with romaine hearts, croutons, Caesar dressing, and parmesan shavings. Mix yeast and water in a large bowl and let rest for two minutes. With a wooden spoon, mix flour into the mixture. If dough is dry, add more water, 1 T at a time. Cover bowl with a kitchen towel and let rest in a warm spot for about 2 hours so dough can rise. Wrap dough in plastic wrap and refrigerate until ready to use. Recipe makes enough for two large flatbreads. In a food processor, add garlic, parmesan cheese, lemon juice, Worcestershire sauce, dijon mustard, red pepper flakes, anchovies (if using) and egg yolk and blend together. While food processor is still running, slowly pour ½ cup of extra-virgin olive oil in. Blend well. Taste and add more olive oil if necessary. 12 Responses to "Caesar Salad Pizza"
oh my word! what an amazing sounding pizza. you’re right- why should fridays have all the fun?? You have my vote for going back to bed and calling today a wash! I’m still in my pajamas… so technically I’m halfway there. 😉 Mondays TOTALLY call for pizza! And not just any pizza, a stellar pizza like this one! 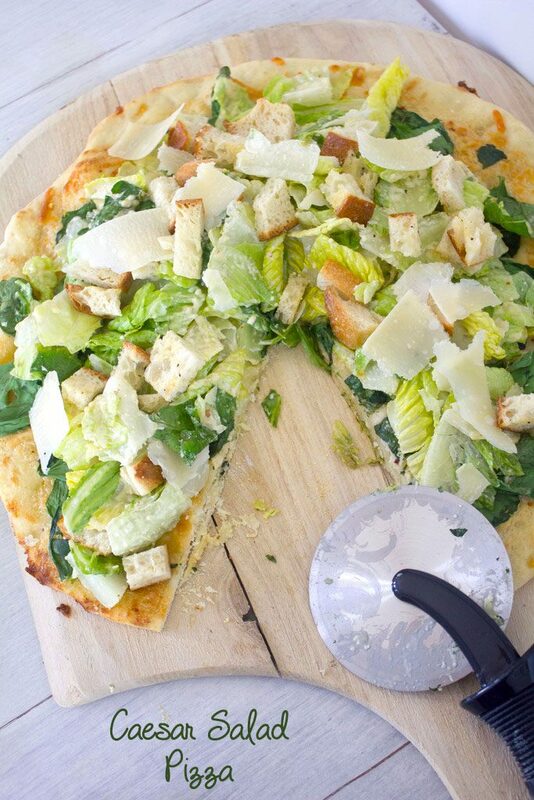 I love caesar salad, so throwing that on some pizza is genius!! I’ll take the whole dang pie please! Cheers! Caesar salad pizza?! It’s like you’ve been reading my dream journal or something. ? This Parmesan crust is seriously inticing! 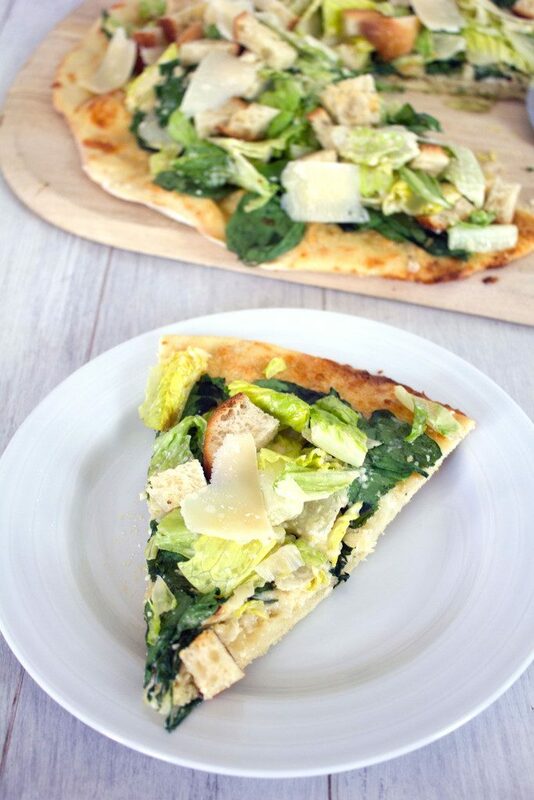 Caesar salad pizza?! Sign me up! What a great idea, Sues! 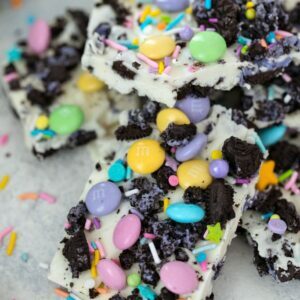 I think I would devour this in no time! 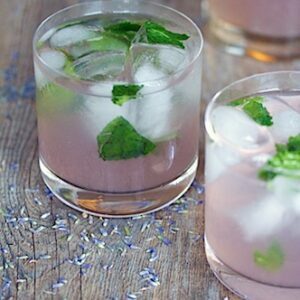 Sues, I absolutely love this recipe…what a great idea! 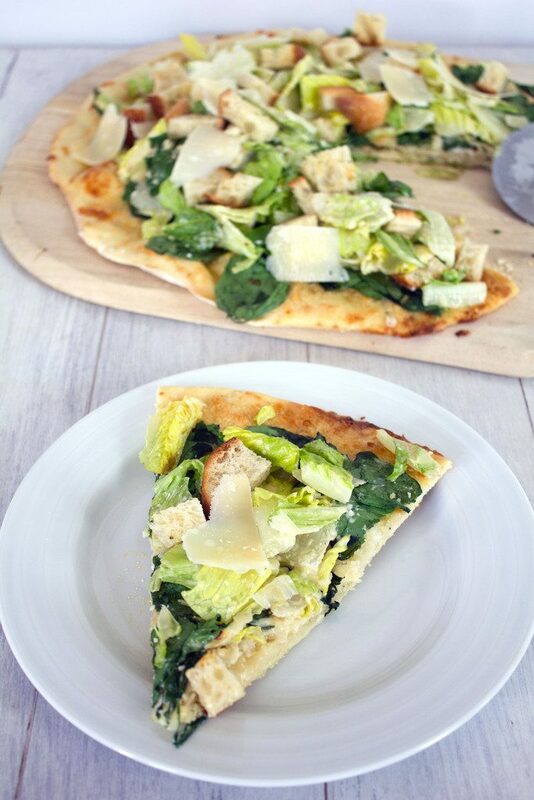 caesar salad pizza! 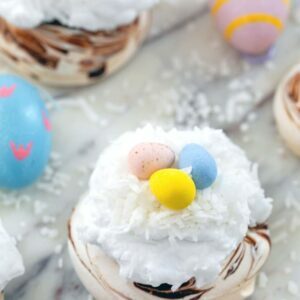 I like it this recipe looks so scrumptious mind blastic idea. I love the idea of a salad pizza, and pizza on a Monday. Monday’s need all the bright spots they can get! This Parmesan dough sounds DELICIOUS. This is everything Mondays need. I’m a Bachelor viewer and spent the whole time thinking “Will You Accept This Podcast” will have a field-day with this episode! If that’s not your bachelor podcast, do share another! This is the best idea ever! One of my favorite restaurants in my hometown had a salad-topped pizza that I absolutely loved — great idea! Love this pizza! And I definitely think Mondays should be the new pizza night!